Hammer the Non-trace nail into the wall until fixation, adjust to hang the hole site of product back is finished. 3.Use these decorative wall hooks in your doorway, on your door, bedroom, hallway, balcony, kitchen, patio, garden or cabin. Goat: 3.54" x 5.51" x 2.76"
Giraffe: 3.54" x 5.1" x 3.15"
Rhinoceros: 1.97" x 4.72" x 4.33"
Antelope: 7.48" x 6.69" x 2.76"
Elephant: 4.72" x 4.33" x 2.36"
Horse: 1.97" x 4.72" x 3.15"
It's not just a hooks, but also a simply wall decor, let you feel nature and make your room more sweety. 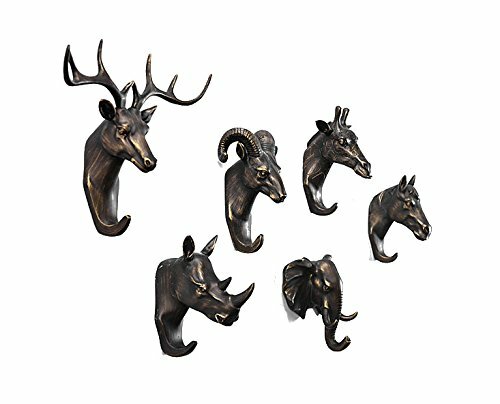 Use these decorative wall hooks in your doorway, on your door, bedroom, hallway, balcony, kitchen, patio, garden or cabin. If you have any questions about this product by MEOLY, contact us by completing and submitting the form below. If you are looking for a specif part number, please include it with your message.